ALBANY - The State of New York has agreed to pay $5 million to settle two civil suits brought by the family of a boy with autism who died in state care, among the larger wrongful-death settlements ever paid by the state. Jonathan Carey, a 13-year-old with autism, died in 2007 while being restrained. 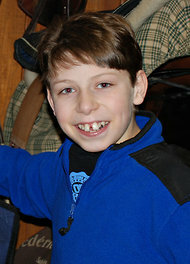 The boy, Jonathan Carey, was 13 when he died in 2007. He was slowly crushed to death in the back of a van by a state worker who was restraining him, while another worker, driving the van, failed to intervene. Depositions of state officials and caregivers have highlighted startling lapses in care at the Office for People With Developmental Disabilities, the state agency that runs more than 1,000 group homes and institutions. The Carey case was the subject of an examination in The New York Times this year, and Jonathan's father, Michael Carey, has become the state's most outspoken advocate for the developmentally disabled. In a written statement, Jonathan's parents, Michael and Lisa Carey, said: "We miss Jonathan every day, and we are so proud of him. We know that his life and all that he suffered has and will continue to help countless other children and adults with disabilities. "Our hope is that all people with disabilities will be treated as special and valuable and have all the basic safety measures put in place to protect them." The office of Attorney General Eric T. Schneiderman, which handled the case on behalf of the state, would not comment on Wednesday, but the Office for People With Developmental Disabilities released a statement. "The death of Jonathan Carey was a horrific tragedy," Travis Proulx, a spokesman for the agency, said. He said that since early this year, Gov. Andrew M. Cuomo and the agency's commissioner, Courtney Burke, had been overhauling all aspects of the agency's operations "to ensure the safety of the individuals we are privileged to serve." The Cuomo administration has taken a number of initial steps to overhaul the agency, including replacing its commissioner, amid a continuing investigation by The Times about problems of abuse and financial malfeasance. Critics of the agency, however, say it remains deeply troubled. "Nothing will bring Jonathan Carey back," the Carey family's lawyer, Ilann M. Maazel of Emery Celli Brinckerhoff & Abady, said. "But we hope his case will spur much-needed reform in the way we care for the most vulnerable people in our state." Jonathan's death came at the hands of a state employee, Edwin Tirado, who had worked nearly 200 hours without a day off over 15 days. Mr. Tirado, a ninth-grade dropout with a criminal conviction for selling marijuana, had been on duty during at least one previous episode of alleged abuse involving Jonathan. Court records also showed that Nadeem Mall, the van's driver, had been fired by four private providers of services to the developmentally disabled. Abuse and injuries were rampant at the state institution where Jonathan was a resident, the Oswald D. Heck Developmental Center, near Albany. Two months after his arrival in 2005, the federal government prohibited it from accepting new residents financed by Medicaid after it failed inspections, a step unknown to the Careys and other parents. The two cases were filed in February 2009, one in state court and one in federal court. The federal case listed more than a dozen current and former state employees as defendants, while the state was the defendant in the state case. Both were concluded as part of the settlement. Several revelations emerged in depositions in recent months, including administrative failures to restrain overtime. Mr. Tirado had once worked 84 days in a row, and a co-worker told an investigator that Mr. Tirado was so exhausted a week before Jonathan's death that she told someone at the time, "Either he's going to kill someone or himself." A state psychologist also told the police that for Mr. Tirado, overtime "was like a badge of honor." The psychologist added: "I asked Edwin when he slept. He said he didn't." David Slingerland, the state official who oversaw O. D. Heck as well as a number of state-run group homes at the time of Jonathan's death, acknowledged in a deposition earlier this year that the amount of overtime Mr. Tirado had worked was a cause of Jonathan's death. Mr. Tirado was later convicted of manslaughter, and Mr. Mall pleaded guilty to criminally negligent homicide. The two men drove around for more than an hour after Mr. Tirado silenced Jonathan, without checking on him or calling 911. Shortly after Jonathan's death, the state passed a law that gives parents access to investigative reports of cases of alleged abuse involving their children.